XL150 first flew on 2nd August 1958. It served with A&AEE Boscombe down from September that year until January 1961. During its time at A&AEE, XL150 took part in radio and heavy drop trials. In February 1961, XL150 went to 84 Sqn in Aden where it remained until August, when it returned to the UK. After a period with 27 MU it was coded ‘K’, and delivered to 47 Sqn at Abingdon in January 1962. ABOVE: A 1960’s winter scene showing XL150 configured in heavy drop role with engines running . 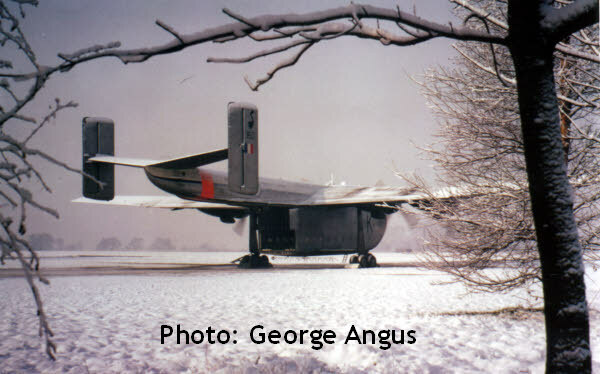 Taken at 47 Squadron dispersal at Abingdon, the photo must have been taken between January 1962 and December 1965. The web master can testify as to how bitterly cold it was standing on the sill of a Beverley carrying out a One-ton Container drop from 800 feet on a cold winter’s day! In December 1965 XL150 went to 32 MU for refurbishment. 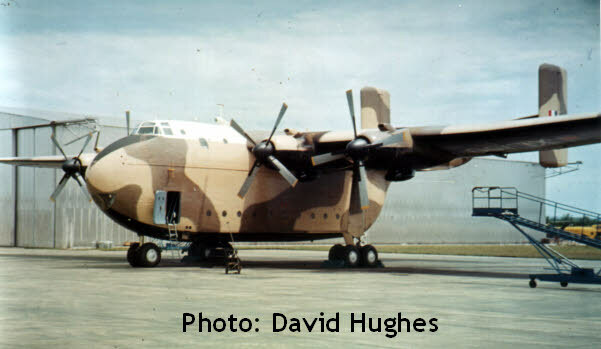 It was painted in camouflage colours and delivered to 34 Sqn at Seletar in Singapore in March 1966. On arrival it was observed that the camouflage scheme was more suitable to the desert than to the jungle. XL150 made a visit to Vietnam in August 1967, delivering Red Cross supplies. Whilst in Vietnam, an engine change was carried out at Loc Ninh. On 15th December 1967, I was duty Air Despatch Crew Commander with 55 AD Sqn RCT at Changi when we were informed that a Beverley had crashed. It was XL150 which went down in bad weather some 72 nautical miles north of Seletar. There were no survivors.